And so from humble beginnings (housed in a $50 a week concrete basement owned by the Transport Workers’ Union) to having overcome numerous challenges (including a fire that claimed their entire studio) Inkahoots are still with us, and perhaps stronger than they have ever been. Their boundaryless practice continues to recieve international recognition for it’s bravery in expression and creativity. The power of the studio doesn’t simply rest in its ideological positioning either – Inkahoots work is vibrant, engaging, and resonant. They transform common verncular and into contemporary design, and completely subvert the “conventions” of politically and socially motivated visual communication. Here Inkahoots member Jason Grant shares a little more about their journey, and what they have learned along the way. 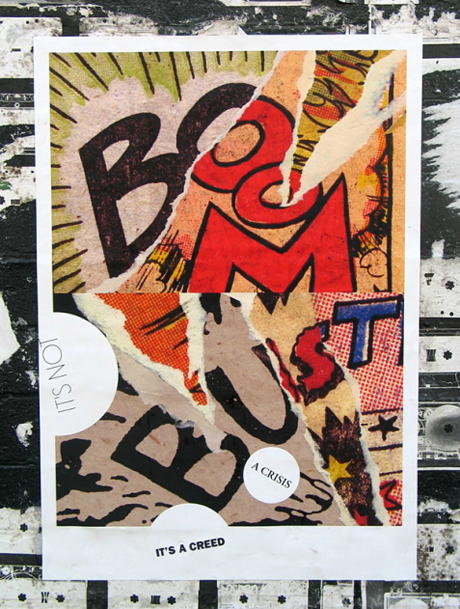 It's Not a Crisis, It's a Creed: Poster commenting on the current economic and ideological meltdown. Inkahoots formed somewhat organically out of a collision of ideas and circumstances, rather than the “traditional” route of a design studio. What is your impression of the current “studio model” and do you believe that it is still possible for new and unique practices to emerge from similar conditions to Inkahoots? We’d guess every moment is an opportunity to create something unique because every epoch is new. Even a twenty-year-old studio like Inkahoots is constantly changing in response to shifting circumstances, and of course not necessarily always getting it right. But sure, the current typical hierarchical, servile and disengaged studio model is a tired vestige of corporate modernism. And while we certainly wouldn’t begrudge anyone the means to earn a living, if we’re really as creative as we keep claiming, can’t we imagine other ways to conduct our business? Embedded in the constitution of most contemporary practices are unchallenged, deeply conservative assumptions about the nature of power, and the role of the marketplace. Maybe one of the obstacles to building an alternative studio model is the slow burn. It just takes a lot of time to forge a path. 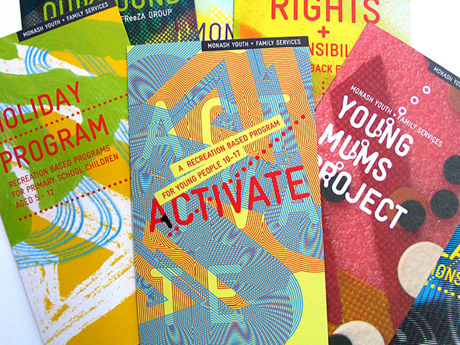 When we started we had a couple of Australian activist poster collectives (like Redback Graphix and Earthworks) to look to, and then a graphic design studio like Grapus in France, and that was enough. But they were always more proof of possibility and general inspiration than specific blueprint. They were practices that were born out of an ideological commitment to confront circumstances that have only since intensified. 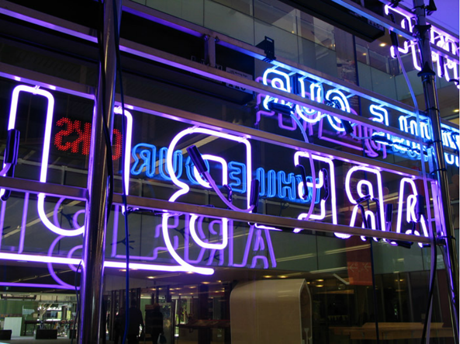 New Anthems IV: A neon typographic interactive sculpture commissioned for the Ideas Festival as part of the ongoing New Anthems series. New Anthems IV: By inserting words via SMS into the Midnight Oil song 'Beds are Burning', participants played with expressions of national identity. It could be argued that under the Newman government, Queensland is seeing a return to the conservative political climate that created those particular conditions for the formation of Inkahoots. Do you think that our industry today is equipped and motivated to respond? Yes, even though everything always changes, a lot of Queenslanders who lived through Bjelke Peterson’s tyranny are feeling a sinking sense of deja-vu. But it’s a different time, and there is no way the Little Major will be as politically successful as the Peanut Farmer. But our industry isn’t really equipped to do very much at all, let alone respond to reactionary governments. The ‘industry’ is a lost cause, wedded as it is to the market’s priorities of privilege and profit, although design as a discipline is another matter. In more generous moments, we imagine design as an impressionable comic book hero with erratic control over her super powers. Usually though, it’s a depressing picture of complicity and denial. Most designers aren’t necessarily ideologically committed capitalists, yet our practices are designing a way of being in the world that is bringing us to the brink. Does Inkahoots have a guiding manifesto or set of principles that it strictly adheres to, or do you assess new projects and causes on a case by case basis? It’s not much of a manifesto, but generally, commissioned projects need to be socially constructive, have creative potential, and on a more pragmatic level, be financially viable. 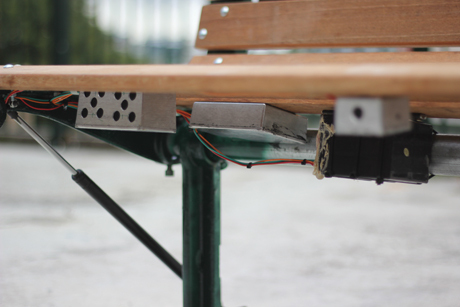 Bitter Bench consisted of a seat fitted with a motion sensor that triggered recorded voices of homeless citizens, attracting pedestrian's attention, while a mechanism tipped them off when they sat down. 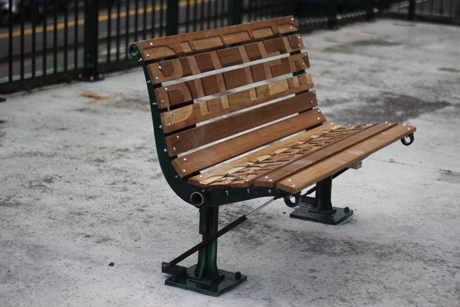 Engraved in large letters on the seat's wooden slats was the phrase "BITTER BRISBANE" and official looking Council plaque accompanied the seat with a quote from Campbell Newman's repentant alter ego publicly denouncing his past harassment of the homeless. The work was removed by the police after 2 days. 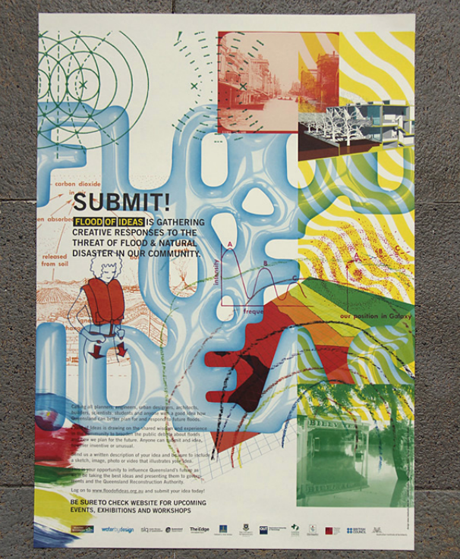 Looking back at some of the very early projects of Inkahoots, such as the Tenants’ Union of Queensland posters, I’m reminded of the function of graphic design as a tool for social and cultural communication, as opposed to simply being a visual agent of marketing. How do we reconnect with this? It’s interesting you draw a distinction between communication for social and cultural organisations and contemporary marketing. Unfortunately we think this is an old-fashioned differentiation, born before the smothering fog of commodified culture. Now even social organisations with oppositional agendas are led by corporate marketing strategies (branding, for example) that smuggle in ideological transgression and potentially change the character of the organization and its broader influence. So those early posters for the Tenant’s Union were ad hoc and visually raw, a grassroots community expression – now they would be required to conform to branding guidelines. I’m not saying there’s not a place for visual consistency in identity design – we’ve done plenty of style guides ourselves – but the uncritical application of any communication methodology is asking for trouble. Especially one that has nothing to do with real human need. 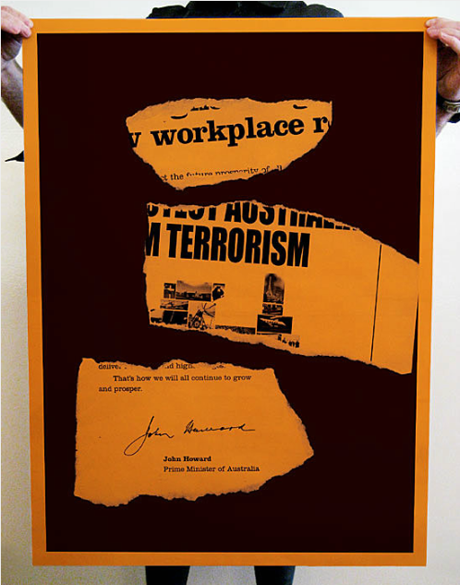 Work Terror: Campaign poster condemning Australia's new industrial relations and anti-terrorism legislation using the Government's own propaganda. Boundless Plains to Share: A poster for The Australia Project. The line in Advance Australia Fair welcoming refugees and immigrants is the only part of the nonsensical national anthem that actually makes any sense. How have Inkahoots managed to be so selective in the clients and projects it’s taken on, while still keeping the lights on in the studio? We’re a small studio with grand creative aspirations and modest financial goals. And our clients and collaborators understand that we are part of what they are doing, that we have an intrinsic stake in what they are doing. They are going to be confident that the success of their project relates to more than just Inkahoots’ business ambitions. But to be honest sometimes it’s an utter mystery how we’ve made it this far. When dealing with clients and causes that require a particular degree of sensitivity or special consideration, how do you frame your approach to ensure that outcomes don’t veer into territory that could be viewed as exploitative or offensive? It’s a question of alienation. If we define ourselves as servile and neutral – the industry’s definition of ‘professional’ – then we define ourselves as separate from our clients and their interests and concerns. But if we recognise our shared interest and concerns, issues of exploitation become redundant. And no particular project then requires special sensitivity and consideration. How do you think that we as an industry can develop a better, more comprehensive understanding of our clients and the causes we support? We start by understanding them as our common causes. And crucially, we are actually interested in our clients and their work. If you want to do real estate branding and mining company collateral, fine, but we don’t buy that notion of the designer as a mercenary – if there is dispassion or ethical dissonance, well there are plenty of other worthwhile vocations. Nobody’s twisting anybodies arm. 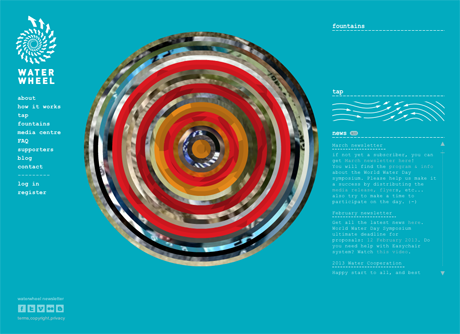 Waterwheel: An interactive, collaborative platform for exploring water as a topic and metaphor; an online space for sharing media and ideas, performance and presentation. Flood of Ideas: Following the Queensland floods of 2010/11, where three quarters of the state was declared a disaster zone, Flood of Ideas was established to gather diverse and creative ideas from the community on how to better plan for and respond to future floods. Ideas generated from the website were exhibited and distilled via workshops to be presented to government. There has recently been something of a glut of issues-based design projects such as the many “posters for Japan” initiatives, which were largely quite vague about the actual purpose that the designs served, and where any aid they generated might be directed. Do you think there is a danger of fetishising this type of work, and how can we become better equipped to understand the role that design can play in similar situations? 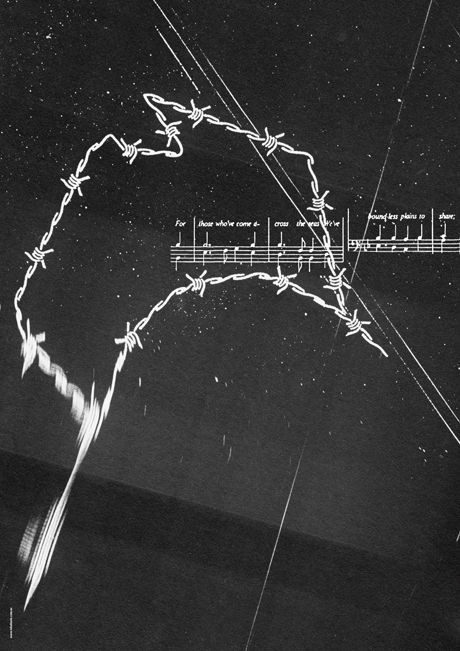 The creative act can be a distraction, as well as an engagement. It’s sometimes difficult to distinguish genuine participation from posing, and posing is sometimes actually effective participation anyway. Generally though, what the projects you mention lack is structural critique. They might respond with good intentions – and who would begrudge raising cash for charity – but many deal with the issues in a superficial way, in a way that avoids approaching the real issues. For example, regarding the 2011 Japanese earthquake, where were the considered, eloquent visual critiques of the manmade dimension of the disaster – the second biggest nuclear incident after Chernobyl? Is relying on a volatile and toxic energy source appropriate in geologically unstable regions? Is it ever appropriate? Is nuclear really a viable alternative to fossil fuel as a clean power source given increasingly extreme weather events and inevitable geopolitical instability relating to climate change? “It’s just a poster to raise funds for charity, right? It doesn’t need to change the world!” But there are times when silence is a distraction enabling business as usual. And the Japanese people, for example, don’t want business as usual. Anyway, our general point would be that it’s not primarily awareness that needs to be raised – most of us already know that racism is wrong, that war is bad, that global warming is a threat. But without a structural critique our understanding is limited, and without this understanding we are paralysed, we see the problems but just can’t effectively engage with them. Amphetamine Awareness: A national drug education campaign for amphetamine users and health works. The publications present information using a visual language that avoids condescension (and subsequent alienation) for the diverse audience. Monash Youth & Family Services: Identity and information materials for a Melbourne council service that develops and implements programs to encourage individuals and families to reach their full potential, and increase their physical, social, intellectual and emotional well-being. The first incarnation of Inkahoots was as a community screenprinting studio. How important has that particular craft been to your practice, both aesthetically and in terms of your approach? 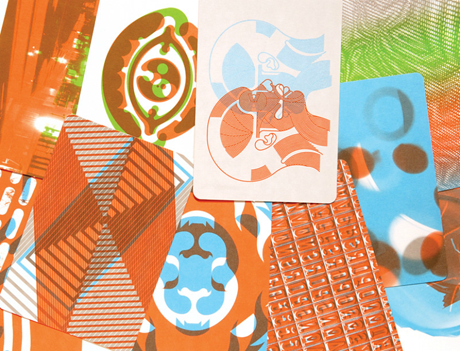 Back then screenprinting was just an accessible process. It probably wasn’t the fetishized, highly aetheticised medium it is now – you know, a hand made analogue medium, in contrast to the more mechanised digital alternatives. Although for sure collectives around Australia were producing beautiful and powerful images exploiting the medium’s unique qualities. In this context screenprinting was really just one of the few affordable means of mass communication. People who had never made a poster before could learn the process in an afternoon, and they could be posting around the city that same night. We sometimes wonder if there is an aesthetic legacy in our work related to a kind of optical flatness and layering, but who knows? 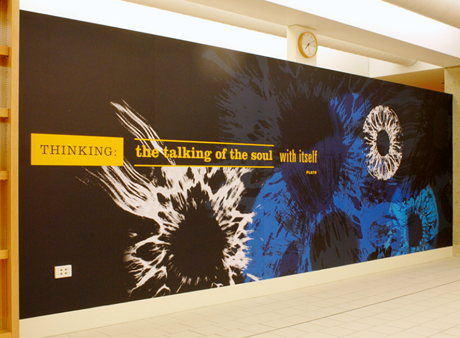 Mural (1 of 4) for the new State Library of Queensland represent different themes related to the collection, including poetry, music, and philosophy. More recently, Inkahoots have expanded their work in the physical space – using everything from LED signs to old road signs as a design and communications tool. What excites you about the use of these materials, and how do you go about determining the appropriateness of use for such unusual tools? 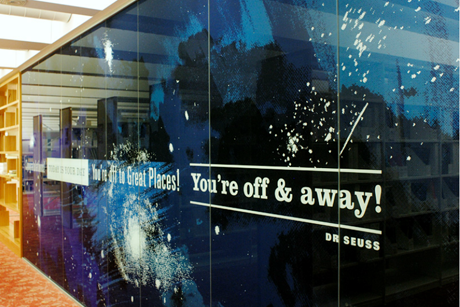 Well print design works in physical space too. It’s all just a means to public address. We believe the impact of the street poster for example is that unlike the web, it is a shared physical experience – it’s not merely a virtual reception in a private context, mediated by personal technology. 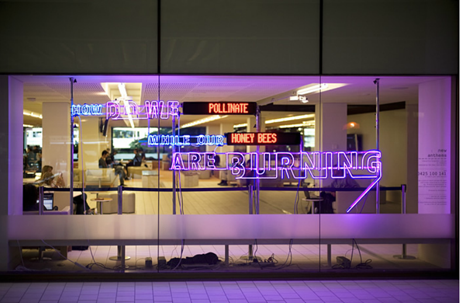 The message enters a public space and competes with the intrusion of traffic, commercial directives, the built environment, the weather etc. So we see these public interactive works as performing a similar role to the traditional street poster, which is our creative genealogy and which we’re still happy to defend. Our bodies negotiate the information, so the potential for engagement remains. Of course what printed communication can’t do (usually) is facilitate multi-sensory interaction; aggregate, analyze and respond to feedback; physically mutate, propagate and react. 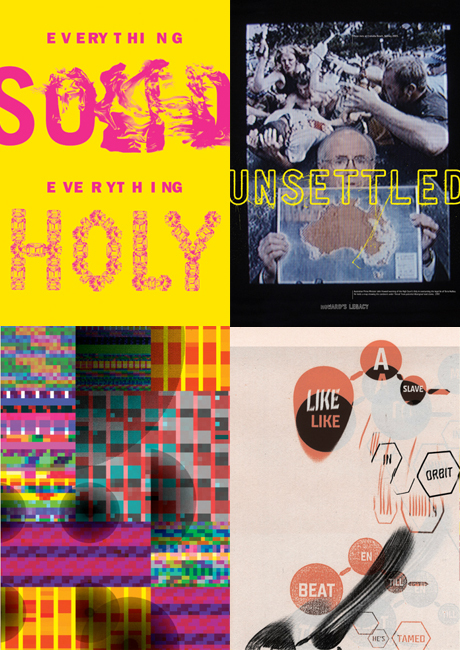 Unsettled: Selected posters exploring the relationship between personal and cultural influence and identity. Featured here are posters influenced by Redback Graphix, Rosalie Gascoigne, Karl Marx, and Dirty Three. As educators as well as practitioners, what are the important qualities that you are trying to instill into your students, and what do you believe design education in Australia needs to do to improve the quality of work and discourse across the industry? We are educated in error and there is a lot of unlearning to be done for sure. There are some radical shifts underway that, if all goes well, will transform the pedagogy. For example we’re involved in the new Design Futures program at QCA here in Brisbane. 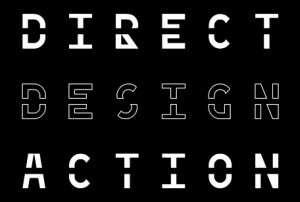 Led by Tony Fry with Oliver Vodeb, Peter Hall and others, it is the most revolutionary attempt to address design education’s flaws and limitations an Australian university has seen. It transgresses the borders of academic and professional disciplines to vastly expand the role and agency of the designer. The traditional indiscriminate industry-focused mission of service provision is replaced by a philosophy that acknowledges design’s role in causing many of our current social and environmental failures. This is achieved by re imaging the student’s capacity for critical learning and thinking. Enjoyed reading this feature? You can find more like it inside desktop magazine. Take a look at this month’s subscription special. Great stuff! It’s not often graphic design gets me excited. Long live Inkahoots! Inkahoots, revolutionary, we need you now more than ever.